Angie grew up in the rural mountains of Colorado in the USA, and attended university at the University of Colorado in Boulder. She graduated with a Bachelor’s degree in Kinesiology and Applied Physiology in 2000, and moved to London and then the Oxford area shortly thereafter. She worked at the University of Oxford in the University Laboratory of Physiology. Realising that work in a lab was not for her, she moved back to Colorado to train in Ultrasound. 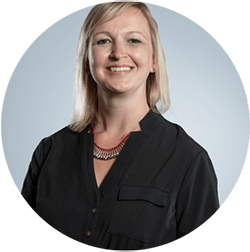 Angie graduated in 2005 from the University of Colorado Hospital Diagnostic Medical Sonography program, and worked as a Sonographer (and later Supervisor) in the Ultrasound Department at Porter Adventist Hospital in Denver, Colorado. She spent ten years at the hospital, where she specialised in General, Gynae, and Vascular ultrasound in very complex patients, with a special emphasis in liver and kidney transplantation, oncologic, and head and neck imaging. In 2015, Angie and her family decided to move back to the UK where she worked in the NHS performing Gynae and General ultrasound. She started at the end of 2015 with The Whiteley Clinic, and has come to have a special interest in Pelvic Venous Incompetence and enjoys research in venous disorders.